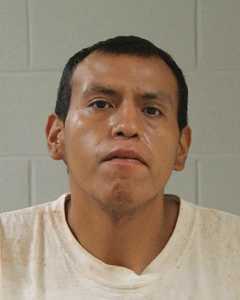 ST. GEORGE — Following a report of a stolen vehicle filed through St. George Police Monday night, Washington County Sheriff’s Office deputies arrested a 29-year-old homeless man for allegedly stealing a 2002 Hyundai Santa Fe. According to a probable cause statement filed by WCSO Deputy Jeremiah Ray, deputies were dispatched Tuesday morning to the Shivwits Paiute Indian Reservation, located west of Ivins on Old Highway 91, where a stolen vehicle had been located through its GPS tracking device. Deputies responded to the GPS coordinates around noon and found the Hyunadai unoccupied and high-centered on a mound of dirt. “It appeared there was an attempt to get the vehicle unstuck,” according to the statement. At the time, no people were in the immediate area of the vehicle. Upon investigation, two people told deputies that Roger Nick Nevermissashot had approached them for help in getting a vehicle unstuck. “The witnesses also said Roger told them the SUV was his and he bought if for $4,000,” Ray said in the statement. Using this information and the help of St. George Police, Nevermissashot was located and arrested for the theft of the Hyundai. After he was read his Miranda Rights, Nevermissashot said he was drinking and took the vehicle without asking, knowing he shouldn’t have taken it, according to the statement, and said he drove it to the Shivwits Indian Reservation and got it stuck. Nevermissashot was booked into the Washington County Purgatory Correctional Facility. He was charged with a second-degree felony for theft of a vehicle. According to bookings information, his bail currently stands at $10,000. So why is this dirt bag out walking around anyway? He should have been in prison for a lot of different things. He certainly is a “frequent flyer” in the system! Ya I been seen tomany come and go. I made cause I did it right. How long they let peoples just come and go. It gives us all what came he right a not so good name. It’s problem in this country that’s not good for no one.i know he’s not locol but I’m not and don’t do this things. So don’t include all together. He has quite the surname!